Info: Screenchomp for iPad only. Free, with no in-app costs. Quick overview: An iPad app that allows teachers (or students!) 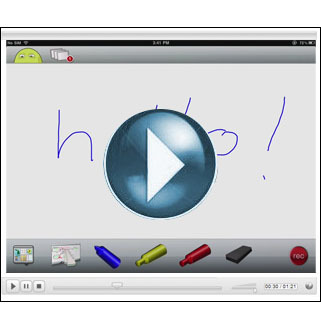 to create a live recording of whatever they write or draw on on the iPad, along with their voice. Easily share the resulting video with others. How does it work? Choose a color, talk, draw, and then share! What I like best is that there’s a very low learning curve involved to use the app, it’s almost effortless to create and share videos. In order to write in the app, you can use your fingers or purchase an inexpensive capacitive stylus, such as the Targus stylus I use with my own iPad. In order for students to view the videos, all they need is a regular computer with a web browser (no iPad required!) and the unique link. No accounts or passwords are needed either. How can it be used in the classsroom: Teachers could use Screenchomp to quickly explain complicated concepts for students study at home without a huge investment of prep time. Students could use Screenchomp for peer teaching or oral presentations. Teachers could even hook an iPad 2 up to a digital projector and record parts of the lesson as they teach. Lastly, younger students could draw and simultaneously recount a story to mobilize language skills. This entry was posted in Tools and Apps and tagged apps, ipad, live recording, mobile, screen chomp, screenchomp, white board, whiteboard. Bookmark the permalink.